We recently installed a Wilwood 6 Piston Big Brake Kit on our 2017 Civic Si and would like to share our experience with you. We should note that Wilwood Stainless Steel Brake Lines are also required, but not included in this kit. Thanks to the great instructions that were included, installation was a breeze. The first step was to assemble the two piece rotors. A 12 point socket is required for this, along with some "red" thread-locker to make sure everything holds together as it should. After completing that, it was time to remove the brakes that were already on the car. The calipers and rotors were quick and easy to remove. The dust shields behind the rotors had to be removed as well because they were too small for the new rotors and that was more of a challenge. The shield is held on by three small phillips head screws that are located behind the wheel hub, leaving them inaccessible with a screwdriver. The best solution we found was to take a pair of needle nose vice grips and firmly grasp them from the side to loosen them. Once we had the right idea, the screws were quickly out. While it is loose now, it is still stuck behind the hub. We had to cut through the shield with a pair of tin snips to finish removing it. Once all of the old components were out of the way, installation of the Wilwood components was very quick and easy. Once everything is all mounted up, you will need to bleed the brakes. You'll notice that each caliper has several bleed screws. You will be working with the bleed screws on the top side, and you will want to bleed the most outward screw first. Once the brake system has been tested and determined safe to operate the vehicle, follow these steps for the bedding of all new pad materials. These procedures should only be performed on a race track, or other safe location where you can safely and legally obtains speeds up to 65 MPH, while also being able to rapidly decelerate. Begin with a series of light decelerations to gradually build some heat in the brakes. Use an on-and-off the pedal technique by applying the brakes for 3-5 seconds, and then allow them to fully release for a period roughly twice as long as the deceleration cycle. If you use a 5 count during the deceleration interval, use a 10 count during the release to allow the heat to sink into the pads & rotors. After several cycles of light stops to begin warming the brakes, proceed with a series of medium to firm deceleration stops to continue raising the temperature level in the brakes. Finish the bedding cycle with a series of 8-10 hard decelerations from 55-65 MPH down to 25 MPH while allowing a proportionate release and heat-sinking interval between each stop. The pads should now be providing positive and consistent response. If any amount of brake fade is observed during the bed-in cycle, immediately begin the cool down cycle. Drive at a moderate cruising speed, with the least amount of brake contact possible, until most of the heat has dissipated from the brakes. Avoid sitting stopped with the brake pedal depressed to hold the car in place during this time. Park the vehicle and allow the brakes to cool to ambient air temperature. Expect large amount of dust and some smoke from the pads and rotors during the bedding procedure. We are very pleased with this kit from Wilwood and are happy to recommend it to all 2016+ Civic owners. The kit fits all Civic models other than the Type R. It is available with red or black calipers, and slotted/drilled or slotted only rotors. We should note this kit actually fits most 2006+ Civics. A small 3-5mm wheel spacer may be required if you are using these with the factory wheels. Most any aftermarket wheel should have no fitment issues. The minimum wheel diameter is 17". 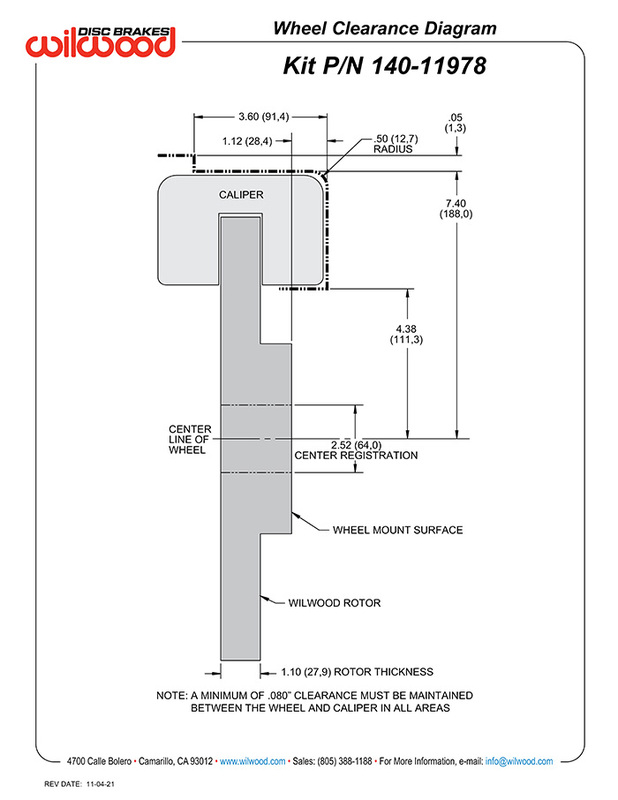 A wheel clearance diagram can be viewed here.